Sewer system complications can be stressful and often times difficult to deal with. Rapid Plumbing promises to take care of all your sewer repairs so that you don't have to worry about a thing. At Rapid Plumbing, we know plumbing and we are dedicated to helping you with any issues that may arise. Not only are we dedicated to our customers, but our technicians are trained with the newest technology for sewer pipe repairs. You can say goodbye to traditional plumbing companies that take forever to complete a job and then leave a mess for you to clean up. We use a trenchless method for all sewer repairs that is quicker, more convenient, and much cleaner than the normal pipe repair techniques. We've seen countless people in the Burbank, California struggle with getting sewer pipe repairs from other plumbing companies. The financial and mental strain of the whole process can take a toll when the traditional methods are used. When you call a professional at Rapid Plumbing to come repair your pipes we will make sure there is no stress on you when it comes to costs and the actual work. Compared to other plumbing companies, our jobs are a fraction of the costs and take substantially less time to complete. To repair sewer pipes using the trenchless method, we do not require any trenching or digging on your land. All we need is a small access point to gain entry to the damaged pipe so that we can insert a liner made from an epoxy solution into the existing pipe. Once this solution cures (which only takes up to a few hours) it becomes a whole new pipe within the old pipe. Your newly lined pipe will be stronger and more structurally sound than ever before and it will have a lifespan of at least 50 years. Because the whole process takes just a day or so to finish, you are not inconvenienced by days or weeks of your water and sewer turned off, foul stenches on your property from pipes that have been dug up, or the hassle (and added cost) of staying in a hotel while the repairs are being done. We will leave your property just as it was when we arrived. Other companies turn your land into a disaster zone and you are left with the cost and responsibility of restoring it afterward. 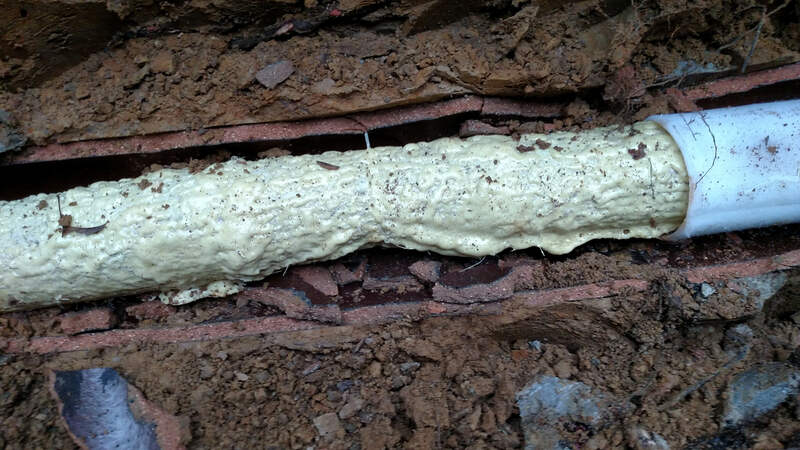 Rapid Plumbing has used trenchless sewer lining to repair pipes all over the Burbank area and our techniques have proven to be effective time and time again. Call us for all your pipe repairs and we will handle all the hard work and worrying so that you don't have to. Our trained professionals are dedicated to your plumbing and making any repairs as stress-free for you as possible. If you call Rapid Plumbing for sewer pipe repairs, you will have peace of mind that your new pipes will not fail and a guarantee/warranty on any work that we do. Call us today and let us get your sewer pipes working better than ever before.